outcomes with students, while avoidance coping predicted high level of stress and burnout. between personality, values and skills and the circumstances. other countries (Kantas, 2001; Polychroni & Antoniou, 2006). three burnout syndromes and teachers’ occupational stress. personalization than male teachers (Lau, Yuen, & Chan, 2005). and family interaction (Kantas, 2001). fective in relation to primary school teachers. avoidance of the problem can aggravate pressure (Chan, 1998). high levels of personal achievement. tion from the state (α = 0.74). reduced personal accomplishment (α = 0.78). problem solving (α = 0.68). in motivation of student F(1, 384) = 20.1, p < 0.001, η2 = 5%. F(1, 384) = 11.2, p < 0.01, η2 = 2.8%. than men F(1, 383) = 6.58, p < 0.05, η2 = 1.7%. 6.05, p < 0.05, η2 = 1.6% more than men. Means of occupational stress, burnout and coping strategies as a function of school level. 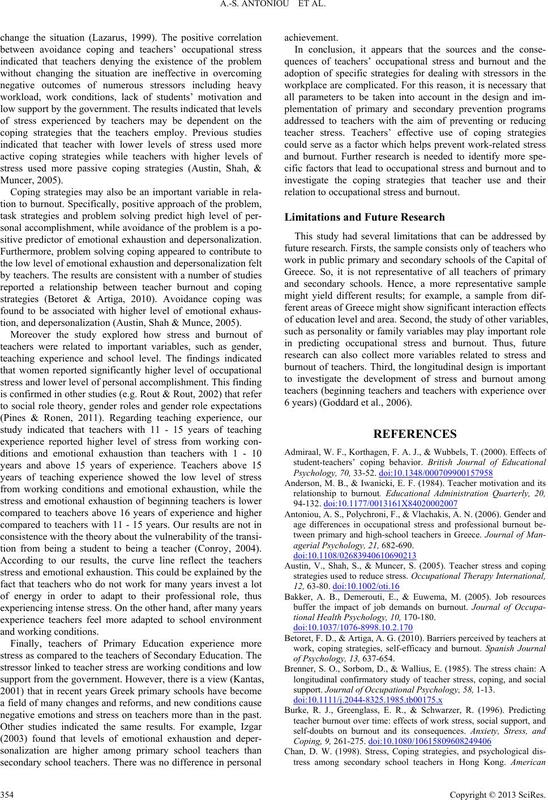 Means of occupational stress, burnout and coping astrategies as a function of years of teaching. Note: **p < 0.01, ***p < 0.001. Means sharing a common subscript do not differ significantly according to Bonferroni post hoc criterion for α = 0.05. “school level” and step 4 was “coping strategies” (Table 3). 0.01 and working conditions β = –0.14, t = –2.81, p < 0.01.
β = 0.18, t = 3.55, p < 0.001, R2 = 0.049. < 0.01 were related to high level of personal accomplishment. –2.07, p < 0.05, R2 = 0.008. Regression analyses predicting burnout from coping strategies. ote: *p < 0.05; **p < 0.01; ***p < 0.001.
sitive predictor of emotional exhaustion and depersonalization. tion, and depersonalization (Austin, Shah & Munce, 2005). tion from being a student to being a teacher (Conroy, 2004). negative emotions and stress on teachers more than in the past. relation to occupational stress and burnout. 6 years) (Goddard et al., 2006). support. Journal of Occupational Psychology, 58, 1-13. 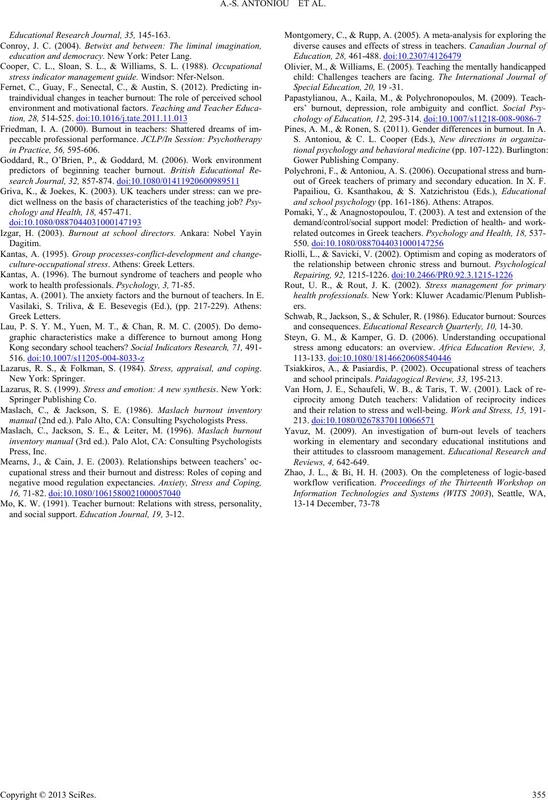 Educational Research Journal, 35, 145-163.
education and democracy. New York: Peter Lang. stress indicator management guide. Windsor: Nfer-Nelson. chology and Health, 18, 457-471.
culture-occupational stress. Athens: Greek Letters. work to health professionals. Psychology, 3, 71-85. Kantas, A. (2001). The anxiety factors and the burnout of teachers. In E.
Lazarus, R. S., & Folkman, S. (1984). Stress, appraisal, and coping. manual (2nd ed.). Palo Alto, CA: Consulting Psychologists Press. and social support. Education Journal, 19, 3-12. Special Education, 20, 19 -31. Pines, A. M., & Ronen, S. (2011). Gender differences in burnout. In A.
out of Greek teachers of primary and secondary education. In X. F.
and school psychology (pp. 161-186). Athens: Atrapos. and consequences. Educational Research Quarterly, 10, 14-30.
and school principals. Paidagogical Review, 33, 195-213.